In September 2011, a little over two years into its existence and fresh off some high-profile victories in the midterm elections, the Tea Party hosted its first presidential debate in Tampa, Florida. Late in the evening, CNN moderator Wolf Blitzer asked Congressman Ron Paul, a physician by training, what should happen to a 30-year-old healthy young man who decides to forgo insurance but then becomes catastrophically ill. “Who’s going to pay if he goes into a coma, for example?” Blitzer inquired. Can California Achieve Universal Health Care in the Age of Trump? The GOP’s ignominious withdrawal of the American Health Care Act, backed by President Trump and House Speaker Paul Ryan, brought this insurrectionary moment full circle. Rebranded and purified as the House Freedom Caucus, the Tea Party’s hard-core members took Ryan’s already shoddy proposal—including a giant tax cut for the super-wealthy and the end of coverage for some 24 million Americans—and extracted concessions that would have made it remarkably worse. The caucus insisted on gutting the requirement that insurance companies offer essential benefits, permitting them to sell junk plans. As the clock wound down on negotiations, it was still holding out in the hope of repealing Obamacare’s most popular provisions, which allow young adults to stay on their parents’ plans and require coverage of patients with preexisting conditions. The resulting monstrosity would have simply allowed millions of sick Americans to die. Moderates bolted, even as the Freedom Caucus refused to budge. And so ended, at least for now, the Republican Party’s abiding obsession with abolishing Obamacare. “A complete disaster!” as Trump might say. But one richly earned. Since the first year of Obama’s presidency, the Republican establishment has allowed its extreme right-wingers to run off the leash. It has amplified their every outburst, fed every conspiracy theory, nurtured every grievance, and enabled every act of hostage-taking. Now, it—and the vandal in chief that the Tea Party helped elect president—is their hostage. In the battles ahead on infrastructure spending, taxation, and the debt ceiling, there’s no reason to believe that the GOP will behave in any less dysfunctional a manner. Given this self-inflicted gridlock, Democrats may be tempted to let the Republicans implode and live with the status quo. This would be a catastrophic mistake. The grassroots uprisings that swarmed congressional town halls with angry constituents were not, at their core, a defense of Obamacare’s particulars. “Keep your hands off my Affordable Care Act premium tax credit!” protested nobody, ever. 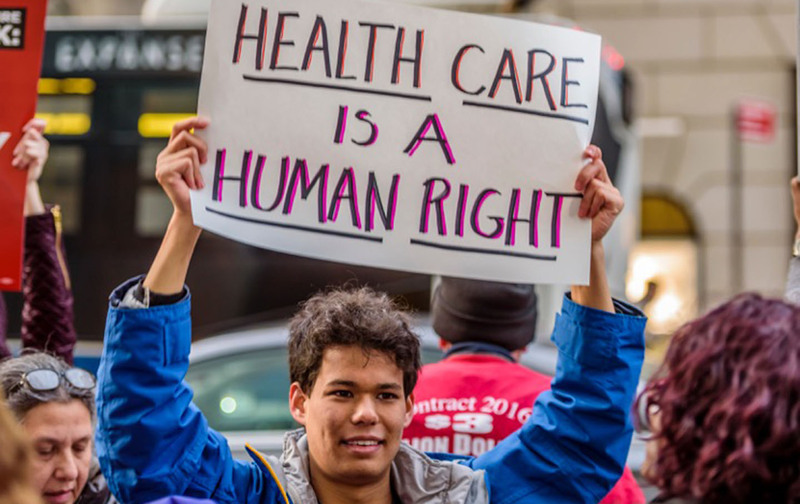 The 25-year-olds who raged at the prospect of getting kicked off their parents’ plans, the senior citizens worried about out-of-control costs, the patients anxious about preexisting conditions, were expressing a much more profound belief: that health care is a fundamental right. care’s true architect, recently told a questioner at a town hall, “I supported single payer since before you were born.” More importantly, the citizen coalition to defend Obamacare—backed by Planned Parenthood, the AARP, MoveOn, Our Revolution, the chapters of Indivisible, and others—is amped up to push for its passage. In 2009, the Obama administration purposefully tamped down that energy, preferring to run an inside game. But with Trump in the White House and the Freedom Caucus bullying Congress, the only game now is on the outside. Along the way, Democrats must continue to defend the current law. Trump’s promise to “let Obamacare explode” was not an empty threat. Already he’s appointed two leading saboteurs to head key agencies: Tom Price at the Department of Health and Human Services and Seema Verma at the Centers for Medicare and Medicaid Services. Together, they could radically reduce subsidies to insurance companies, causing more to leave the exchanges; discourage enrollment and weaken enforcement of the individual mandate; undermine Medicaid by allowing states to impose premiums and work requirements; and reinterpret what qualifies as an essential benefit, letting insurance companies offer stingier plans. These changes will come wrapped in a thick fog of bureaucracy—and it’s up to progressives to expose and humanize what’s really happening. We also need to counter each proposed cut with an alternative plan to expand and improve coverage: to extend Medicaid, increase subsidies, elevate insurance standards, and lower the Medicare eligibility age to 50, as Senator Jeff Merkley has proposed. Taken together, these steps would grow the public aspects of Obamacare while reducing its reliance on private markets. When the bill was first passed, centrist Democrats placated its critics on the left by claiming that Obamacare could act as a bridge to a single-payer system. Wouldn’t it be amazing if that actually came true—and if the Tea Party helped make it happen?